Illustrations note 9 Illustrations, black and white; XIV, 600 p. 9 illus. 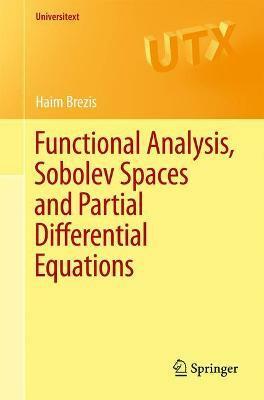 Uniquely, this book presents a coherent, concise and unified way of combining elements from two distinct "worlds," functional analysis (FA) and partial differential equations (PDEs), and is intended for students who have a good background in real analysis. This text presents a smooth transition from FA to PDEs by analyzing in great detail the simple case of one-dimensional PDEs (i.e., ODEs), a more manageable approach for the beginner. Although there are many books on functional analysis and many on PDEs, this is the first to cover both of these closely connected topics. Moreover, the wealth of exercises and additional material presented, leads the reader to the frontier of research. This book has its roots in a celebrated course taught by the author for many years and is a completely revised, updated, and expanded English edition of the important "Analyse Fonctionnelle" (1983). Since the French book was first published, it has been translated into Spanish, Italian, Japanese, Korean, Romanian, Greek and Chinese. The English version is a welcome addition to this list. The first part of the text deals with abstract results in FA and operator theory. The second part is concerned with the study of spaces of functions (of one or more real variables) having specific differentiability properties, e.g., the celebrated Sobolev spaces, which lie at the heart of the modern theory of PDEs. The Sobolev spaces occur in a wide range of questions, both in pure and applied mathematics, appearing in linear and nonlinear PDEs which arise, for example, in differential geometry, harmonic analysis, engineering, mechanics, physics etc. and belong in the toolbox of any graduate student studying analysis. Preface.- 1. The Hahn-Banach Theorems. Introduction to the Theory of Conjugate Convex Functions.- 2. The Uniform Boundedness Principle and the Closed Graph Theorem. Unbounded Operators. Adjoint. Characterization of Surjective Operators.- 3. Weak Topologies. Reflexive Spaces. Separable Spaces. Uniform Convexity.- 4. L^p Spaces.- 5. Hilbert Spaces.- 6. Compact Operators. Spectral Decomposition of Self-Adjoint Compact Operators.- 7. The Hille-Yosida Theorem.- 8. Sobolev Spaces and the Variational Formulation of Boundary Value Problems in One Dimension.- 9. Sobolev Spaces and the Variational Formulation of Elliptic Boundary Value Problems in N Dimensions.- 10. Evolution Problems: The Heat Equation and the Wave Equation.- 11. Some Complements.- Problems.- Solutions of Some Exercises and Problems.- Bibliography.- Index.